Choose the car that best suits your needs. Our website Clutch.ca will show you every detail you want to know for each vehicle. We include a CarFax report and our own 210-Point inspection. All you have to do next is click the button! 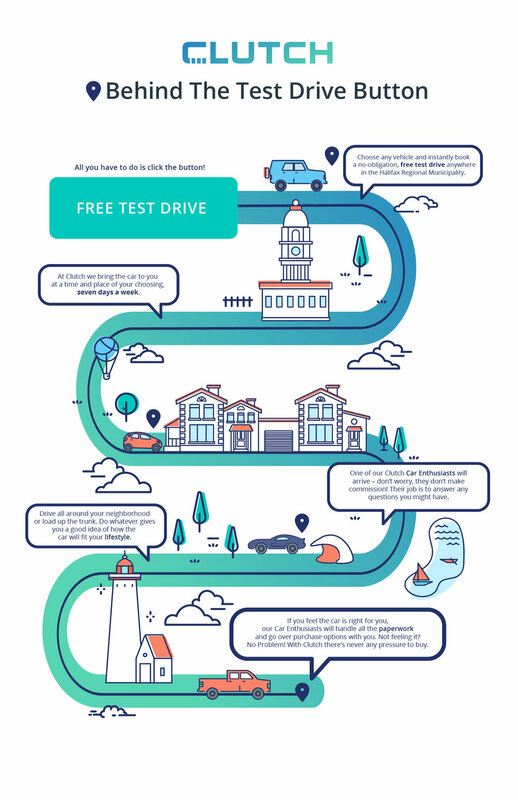 You’ve clicked the Free Test Drive Button, now what? It’s simple! You just need to fill in a small amount of information so we know how to contact you for the test drive. This includes your name, phone number, and your email address. Now all you have to do is choose a location. You can enter in your address, your work or any location at your convenience. Our automated booking will allow you to pick any HRM location within 100 km. All of our cars show real-time availability, so you can be confident that the time and date you choose for your test drive will be confirmed instantly when you book. You will then receive an email confirming your date, time and place of your booking. If you need to reschedule, it’s as easy as a reply to the email! One of our Clutch Car Concierges will arrive, and don’t worry, they don’t make commission! Their job is to answer any questions you might have. They will ask you for your license so that you can take the wheel. Drive all around your neighbourhood or load up the trunk. Do whatever gives you a good idea of how the car will fit in your lifestyle. If you feel the car is right for you, our Car Concierges will handle all the paperwork and go over purchase options with you. Not feeling it? No problem! With Clutch, there’s never any pressure to buy.